The DPP has officially selected a candidate and Beijing is getting nervous. It’s official: Tsai Ing-wen, the chair of Taiwan’s opposition Democratic Progressive Party (DPP), will be her party’s candidate for next year’s presidential race. Tsai was uncontested for the nomination. She previously served as the DPP candidate in 2012, when she was defeated by incumbent Ma Ying-jeou 51 percent to 45 percent. Tsai’s chances look better this time around, with the DPP riding high on sweeping victories in last November’s local elections. More seriously, the ruling Chinese Nationalist Party (KMT) is facing something of an identity crisis as it tries to rebrand itself. The KMT does not even have a consensus candidate for next year’s election, and might not decide on one until July or August, according to Want China Times. The most likely contender, KMT Chairman and New Taipei Mayor Eric Chu, previously vowed not to run. As her candidacy officially begins, Tsai will face questions about the DPP approach to cross-strait relations. Ties with Beijing were rocky under the last DPP president, Chen Shui-bian, whom Beijing saw as an advocate for Taiwanese independence. Current President Ma Ying-jeou came to office in 2008 on a promise to revitalize cross-strait relations, resulting in a rapid expansion of economic and people-to-people exchanges. Tsai promises that the DPP will maintain the “status quo” in cross-strait relations, an attempt to downplay fears that the DPP will seek de jure independence for Taiwan. “It is the DPP’s responsibility to maintain stability across the Taiwan Strait,” Tsai said. In a meeting of the DPP’s China Affairs Committee in January 2015, Tsai acknowledged the importance of cross-strait relations, but also emphasized the need for the relationship to “benefit the national development of freedom and democracy” and to be “mutually advantageous” for both sides of the strait. Beijing is still leery of a DPP presidency, as evidenced by remarks from the Taiwan Affairs Office (TAO), which handles cross-strait relations for the mainland. When asked about Tsai’s stated position on cross-strait relations, TAO spokesman Ma Xiaoguang emphasized that the peaceful development of cross-strait relations depends on both sides holding firm to the 1992 consensus and opposing Taiwan independence. “The core is acknowledging that mainland China and Taiwan both belong to one China. 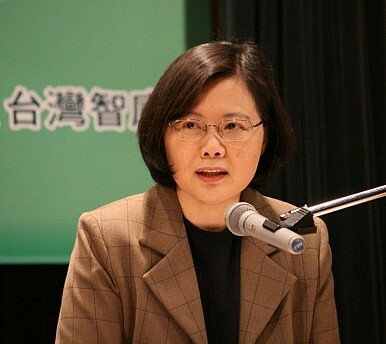 This is the anchor of cross-strait relations,” Ma said in a press conference today. He warned that if Taiwan’s leaders support the “splittist” position of “one country on each side” of the Taiwan Strait, cross-strait relations would face difficulties. Ma has made similar comments, stressing the importance of a “one China” policy, three times in the past week (on April 8, April 10, and April 15), driving home the seriousness of Beijing’s concerns. Though Ma did not directly tie his concerns to today’s DPP, he did reference historical tensions in Beijing’s relationship with the party. The problem of frayed cross-strait relations “isn’t a new issue,” Ma said, “but is what happened between 2000 to 2008” – the last time the DPP held the presidency. The timing of Tsai’s official nomination coincides with a flurry of interactions between the Chinese Communist Party (CCP) and the ruling KMT. KMT chairman Eric Chu is expected to attend the annual Cross-Strait Economic, Trade, and Culture Forum, to be held on May 3 in Shanghai. There are even rumors that Chu might have a meeting with Chinese President Xi Jinping, although neither side has confirmed this. In late April, meanwhile, think tanks affiliated with the CCP and KMT will gather in Nanjing to celebrate the 10th anniversary of a historic meeting between the two party’s then-leaders, CCP General Secretary Hu Jintao and KMT Chairman Lien Chan. The DPP, however, protests strongly against the conflation of party-to-party ties and government-to-government cross-strait relations. Tsai recently hit back at the planed KMT-CCP exchanges, warning that Taiwan-China relations should not be based on KMT-CCP party relations. “[O]ver the past few years, the people have been voicing their disappointment in the Ma administration’s handling of cross-strait relations, because it has been taking (cross-strait relations) as something between the KMT and the CCP,” Tsai said. “This mentality has brought about many problems for the government.” The KMT needs to differentiate between party-to-party exchanges with the CCP and cross-strait relations as a whole, which involve all Taiwanese, Tsai said. KMT presidential candidate Eric Chu used his visit to the U.S. to question his opponent's plans for cross-strait ties.